Hello all, This was my first week this year without Tloml. He has taken a contract far far away from home and so we have to live without him during the week. Now, I recognize that this is the norm for a lot of people. In fact, growing up in Africa, it was a way of life for one of the spouses to be in another country! trying to earn a living but I do not like it. I do not like it at all. I married the man because I loved him and want to spend time with him, not have him far away. Anyway, it is for a season as we continue on this journey towards financial freedom. And also, he quite likes what he is doing. When I think of where we were just a few short years ago, I know I am truly blessed. Now this was the scene I walked into when I was about to go to bed last night. Now, the scene is not completely clear in my very hastily taken picture but let me try to explain it. 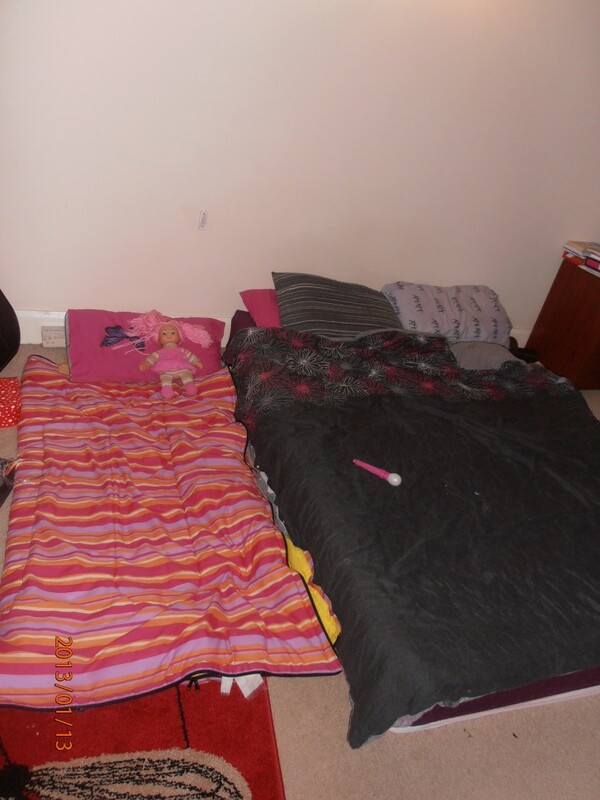 I sleep on a mattress on the floor as I tend to have one child or the other visiting me at night, so it seemed safer to have a mattress on the floor rather than an actual bed. (Yes, I am a bed-sharing mummy 😀 and mostly, I love it – Occasionally, not so much!). My oldest daughter, V, had told me before she went to bed something about how people should share their rooms when other people (like herself) had scary dreams. I laughed as she tried to make a coherent argument as to why she should be allowed to sleep in my bed, rather than her own. She laughed, I laughed and we agreed to disagree. She went to bed in her own bed. Tloml and I return to the bedroom as we went to bed a few hours later and, lo and behold, the room had gained another makeshift bed. A sleeping bag, very precisely placed next to my mattress with two pillows at its head, ready to receive any new addition to my room who may or may not have had a scary dream 🙂 . 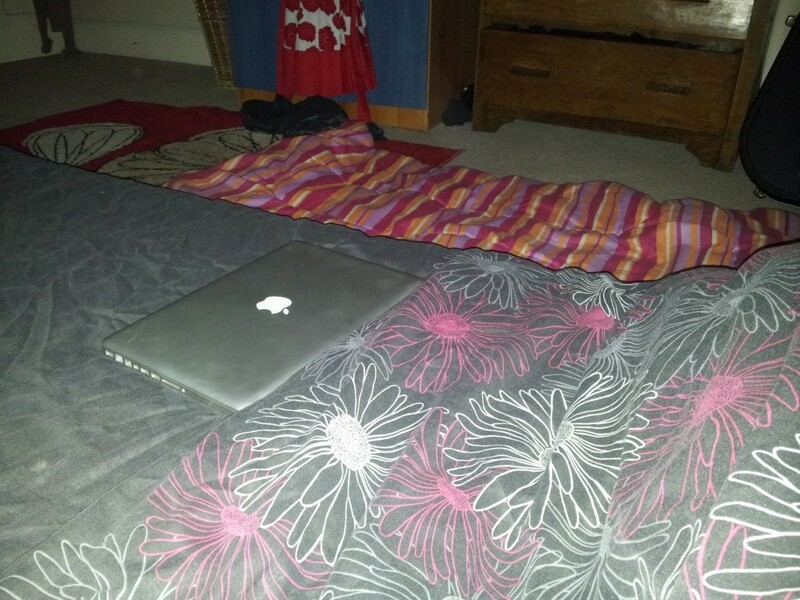 She had even laid my bed for me (yes, I am not the most consistent of bed-layers!). I was highly amused and impressed! If you can’t get what you want directly, why not try an indirect method? Of course, when she turned up (having NOT had a scary dream, just wanting to sleep in Mummy’s room), I gave her a huge hug and sent her back to her room. So it did not quite work out for her last night but the bed is still there and who knows? it might work for her tonight if she is quiet enough and I do not notice. Ultimately, she may get what she wants because she is giving me what I want. I want a peaceful night’s sleep so if she comes in and I do not notice it then I get my way. She wants to sleep in mummy’s room and she gets that too. Win, win! !